What is the best Cozumel Snorkeling Guide? Pack your snorkeling gear and head to the Cozumel Island for its mesmerizing stretch of reefs. The place has very clear waters, which makes snorkeling tours a main attraction. With its vast pools and tourist attractions, one could easily lose sight of what to do. First things first, explore Cozumel’s underwater beauty. But how do you snorkel in Cozumel? All you need is a snorkeling gear. Since all of the gorgeous beaches in cozumel, even the ones in front of hotels and resorts, are federally owned, it is open to the public. It allows for independent snorkelers; meaning you have a choice if you want to snorkel with tourist packages or go on your own. Of course, going with tourist packages is the most viable option because it is not only cheap, but it also covers everything; from providing snorkeling gear up to touring underwater. If you do want to go off on your own, it’s possible too! Tip # 1: Snorkel Equipment While it is cheaper to bring your snorkeling gear, it may be efficient for you to rent snorkeling gear in Cozumel. There are tons of places where you can borrow, and there are places that charge reasonably. Of course, it is not advised to rent in an area that is a prominent tourist trap. Find a place that is not too popular and check if their gears are not worn and old. If you are not a good swimmer, don’t forget to bring/rent a life jacket even though some of Cozumel’s reef spots are shallow. Tip # 2: Getting around Cozumel The island is long, long stretch. You may want to snorkel in the most popular parts in one day but getting on a taxi every time you move is costly. What’s a cheaper option? Renting. You can rent a car, a scooter, or a bike to get you to places. Tip # 3: Snorkeling Spot. There are lots of reefs in cozumel for snorkeling, but not all are for everyone. Some beaches are for expert divers, while there are shallow reefs that will make an intermediate diver bored. Finding your diving or snorkeling level is a must to know how to snorkel in Cozumel. If you are a beginner, try going to shallow reefs that don’t compromise beauty such as the Paradise reef and Chankanaab Reef. Tip # 4: How to Snorkel in Cozumel: Most of the snorkeling spots in Cozumel are not far from the shoreline. You can also visit two reef locations at a time (you’ll never notice how now you have gone once you are distracted with awe). For example, you can start your snorkel in San Juan reef and snorkel toward Barracuda reef where there are tons of fish. Don’t be scared if some of the beaches go deep; the water is so clear that on good days visibility is recorded at 120 feet. Pro-tip: If you are a beginner, sign up for a tour and snorkeling package. They always come with expert divers to guide you. With its perfect environment for coral reef formations, underwater life is abundant. 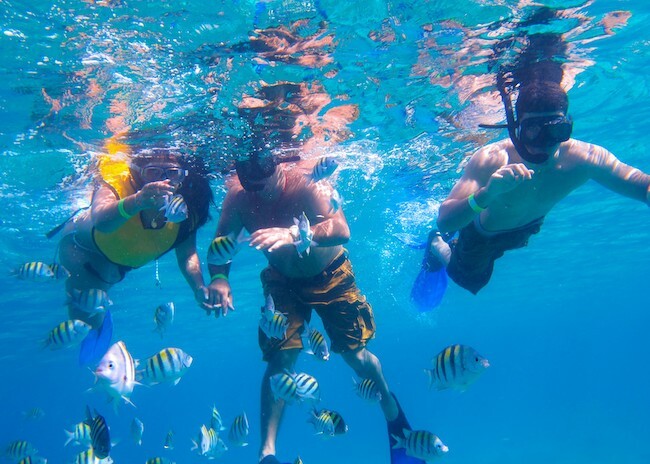 If you have mastered how to snorkel in Cozumel, you will surely have a great and relaxing time. Snorkelers would love the sea creatures bonding with them underneath the island’s turquoise crystal clear waters and mild currents.